During its entire existence the League of Nations could not agree on one single symbol, although in the year of its foundation, 1920, there were proposals for it. This was a blue flag, which had in a white design an oval world map, enclosed by a elliptic ring consisting of as many stars as there were member states. The League of Nations organisations used it for their own operations, but there was no success in having the League of Nations itself to adopt it. Where it was active, like in Danzig or Saarland one used improvised emblems or none at all. In 1929 there was an international contest for a design. On 1 January 1930 there were 1640 proposals, out of which an international jury chose 50. Finally it was decided that none deserved first prize: two second prizes were awarded and three third prizes. The fear that a supranational organisation might become more powerful than the member states lay at the bottom of this hullabulloo. In 1939, as the political role of the League of nations was nearly nil a semi-official emblem emerged: two five-pointed stars within a blue pentagon. A white flag with this emblem was hoisted on top of the pavillion of the New York World Exposition and flew there during two years. 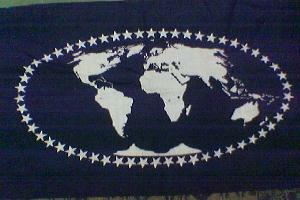 The pentagon and the five-pointed stars were supposed to symbolize the five continents and the 'five races' of mankind. In a bow on top and at the bottom the flag got the names in English and French for the League of Nations. The above two flags were the "second prize" flags agreed to by the League of Nations. The flag flown on the League of Nations Pavilion at the New York World Exposition 1939-1941, designed "to symbolize five continents and five races". In the early 1930's Colombia and Peru were in dispute over a territory called Leticia. The League of Nations became involved to mediate and agreement was reached that the territory belonged to Colombia and that Peruvian troops were to withdraw. The League of Nations appointed an international delegation to oversee the Peruvian withdrawal from Leticia, and to administer the territory until Colombia reassumed control. "3. The Commission has adopted a flag which it will use to distinguish it. 4. The characteristics of this flag are a white rectangle with the inscription in dark blue: 'League of Nations Commission, Leticia'. 5. Once the territory of Leticia has been evacuated, this flag will be flown side by side with the Colombian flag." [League of Nations Official Journal, Vol. 14, 1933, p. 977]. However, in the "First Report by the Commission for the Administration of the Territory of Leticia, Dated September 3rd, 1933" the inscription and ratio is described as slightly different: "a white square with the inscription in dark blue: "League of Nations Leticia Commission." [League of Nations Official Journal, Vol. 15, 1934, p. 21]. Both documents quoted above were translated into English from another language, we may guess French, the diplomatic language, or perhaps Spanish, and it is possible that the flag was inscribed with the commission's name in one of these languages. 1. Was the flag rectangular or square? 2. In which language did the inscription appear? 3. What was the exact wording of the inscription?